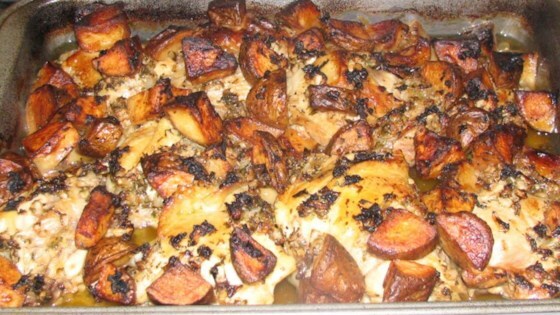 "Baked Italian chicken with lemon and garlic. You can make this dish with any of your favorite chicken parts - breasts, drumsticks, et cetera. Note: the garlic and onion can be put through a food processor." Arrange the chicken pieces in a 10x15-inch enameled roasting pan. In a large skillet over medium high heat, fry the potatoes in 1/2-inch-deep oil until golden brown, then put them in the pan with the chicken. Combine the vinegar, lemon juice, garlic, oregano, parsley, onion, salt and pepper with the 1/2 cup reserved frying oil and pour this mixture over the chicken and potatoes. Bake in the preheated oven for 1 1/4 hours, basting the chicken and potatoes with the sauce mixture. Let rest for 5 minutes and serve hot.